This September, Red Rattle Books will be launching the first book of their Classic Red Rattle series, ‘Frankenstein: Galvanised’. The book launch will take place on the evening of 27th September at the charmingly authentic 7 Dials Club in Covent Garden, just around the corner from literary Bloomsbury. Please join us to support this new edition of Frankenstein, and enjoy the wine, nibbles, and company of varied guests. 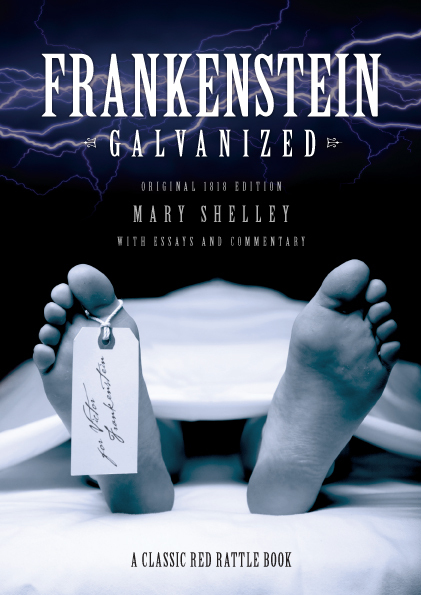 ‘Frankenstein Galvanized’, like the other literary greats featured in Classic Red Rattle Books, is aimed at the general reader, literary student and academic. ‘Frankenstein Galvanised’ is faithful to the original text, in this case the original 1818 edition written by Mary Shelley, but is presented with an easy on the eye print and new features that give the book a different feel. The text by Shelley is complimented with a range of essays from academics and writers. This new edition is edited by Claire Bazin, Professor of 19th Century and Commonwealth Literature at Paris Ouest Nanterre la Défense. Bazin has published two books on Charlotte Brontë’s ‘Jane Eyre’, and two on New Zealand writer Janet Frame. In ‘Frankenstein Galvanised’, Claire compares the gestation of the creature with the creation of the novel. The other studies range from a very accessible history of the novel and the life of Mary Shelley by Marion Sones Marceau, who teaches at Paris Dauphine, to a radical look at Robert Walton, the ship captain whose letters begin the Shelley novel. Author Samia Ounoughi argues that Walton is much more significant than previously understood. Apart from the novel, there are eight essays in the book. Katy Masuga and Laurence Talairach Vielmas also contribute. Masuga is the author of the books ‘Henry Miller and How He Got That Way’ and ‘The Secret Violence of Henry Miller’. Talairach-Vielmas has written ‘Wilkie Collins, Medicine and the Gothic’ and ‘Moulding the Female Body in Victorian Fairy Tales and Sensation Novels’. The event is free but attendance is invite only. If you are interested in attending, please contact Amy Jackson at amy.jackson@redrattlebooks.co.uk. Red Rattle Books is a brand new publishing company that specialises in crime and horror. Visit our website to find out more.